AND MAY BE EXCUSSED FRO OUR TRAINING CENTER. Up to date shot records are required for registration. Training collars and 6-foot lead required. PLEASE NO HALTERS, NO CHAIN LEADS AND NO RETRACTABLE LEADS. PUPPY SOCIALIZATION (4 mos. – 12 mos. ): $30*- 7 week session – Every Wednesday. Same training as beginning obedience but less intensive. AKC S.T.A.R. Puppy℠ Test is offered at the last class. Registration: 5:50 p.m. Class: 6:20 p.m.-6:50 p.m.
Drop in-$5*/person Drop-in Pre-requisite: Must have completed a CSKC Puppy Socialization class. BEGINNING OBEDIENCE (4 mos. & older): $70*-7 week session-Every Wednesday. 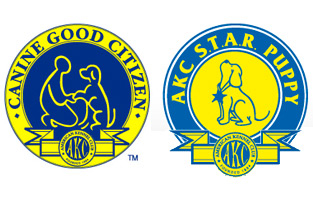 AKC Canine Good Citizen® C.G.C.™ Test offered at last class. Registration: 6:30 p.m. Class: 7:00 p.m.-7:40 p.m.
Drop-in-$8*/person. Drop-in Pre-requisite: Must have completed a CSKC Beginning Obedience class. Chief Solano Kennel Club Inc. is an AKC all breed & obedience club. Meetings are held the first Thursday of every month at the Elmira Fire Station at 7:30 p.m. These meetings are open to the public. Our January meeting is held on a different date. Please phone the above number to R.S.V.P. All those interested in the welfare of our canine friends are welcome! CSKC offers a 10% discount on our obedience and puppy socialization classes to Seniors 55 and over, Juniors under 16, and 20% to those who have adopted a dog from the Humane Society, a Breed Rescue group, or your local shelter. Just bring your adoption certificate when you register!